The streets of New York City was filled with excitement and so much style on Saturday, September 12, 2016. Not even the drenching thunderstorm stopped me from attending the show that night! If you are a fashion lover and follower you know that New York Fashion Week is extremely important because it let us know the trends for the Spring and Summer (S/S) or Fall and Winter (F/W) of the following year. I almost got lost while taking the subway because they switch the trains around which confused me but a few friendly people helped me find my way to the venue on time! The show was organized by event production company The Set NYC who supports and brings together talented artists and Freedom Ladder, which is a nonprofit organization that aims to get people talking about human trafficking. The rain started falling again once I arrived at the venue which was a damper on my hair. My worries quickly disappeared once I walked inside the over crowded venue which was filled with so many fashion-forward people. When I was seated, I seriously noticed everyone’s outfit that came across my path; which kept me entertained until the show started. The grand opening started with Xi Haute Couture. The easy to wear romantic glamorous gowns were lavish with sharp layers and spectacular trains. Most of the models walked down the runway with adorable little girls who wore impressive matching outfits. There were large selection of sharp tailored dresses, skirts, blouses, jumpsuits, suits and beautiful bold jewelry pieces. The designer stuck within a soft array of mixed maroons, grays, blues, apricots/oranges, reds and black colors. Fashion Designer, Sherry Tsang unveiled a dose of dramatic comfy fit ancient Greek feeling to her collection. Some of her dresses were designed with asymmetrical and heavy fringe detailing. She kept the color palette simple white with a touch of silver and gray. The models wore very little jewelry and accessories. The presentation tables were mostly jewelry designers who designed gorgeous hand crafted pieces. There were many beautiful modern dainty to oversized patterns, textures stones and metals with distinctive detailing. Heather LJønes Jewelry New York, adds boldness to a new level! Her jewelry is designed with artistic edgy statement pieces. Joiaa Jewels is a high-end line and their jewelry pieces are designed with real gem stones contoured according to the stone’s shape. 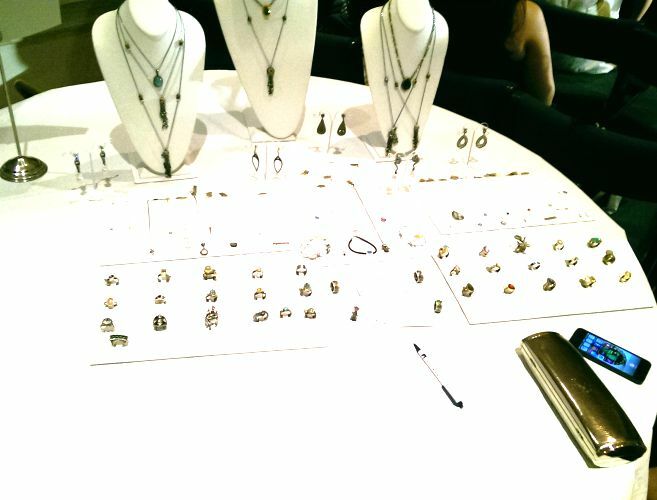 Resa’s Designs has a stylish modern hippie/bohemian feel to her jewelry pieces with gorgeous metals and stone details. Aisa Marie Corrales, has a beautiful vintage chic feel to her pieces. Art Designer, Willie Mitchell with Willy Mitchell Designs thinks out of the box because he has a brilliant collection of fashionable cards, created with illustrated models wearing real fabric. Vivan Eberhart Boutique has appealing fashionable pieces like this trendy clutch handbag that has the words, “London, Paris New York” on it. Glenda you look beautiful next to the designer and the show looks like it was outstanding. The jewelry so pretty thanks for sharing doll. Looks like an awesome event! Love that brown clutch!! Fantastic photos! What an experience! What an amazing show! Thunderstorms wouldn’t have kept me away either 🙂 Thanks for sharing! So interesting and amazing show!!! You’re welcome Shirley, sure will!! !